What started as a railroad boxcar is now a luxurious lodge in Wisconsin. Set on the original site that marked the end-of-the-line for the legendary North Woods Hiawatha train, this newly built six-bedroom lodge, with its screened-in porch and unique boat house set within a pristine forest, boasts magnificent views of Star Lake. Peabody’s was asked to create a family vacation compound to double as a travel rental with fresh, sophisticated style while evoking an authentic Wisconsin cabin. Wicker and timber furnishings, worn leather, handsome, durable textures and heirloom-worthy pieces lend authentic charm. 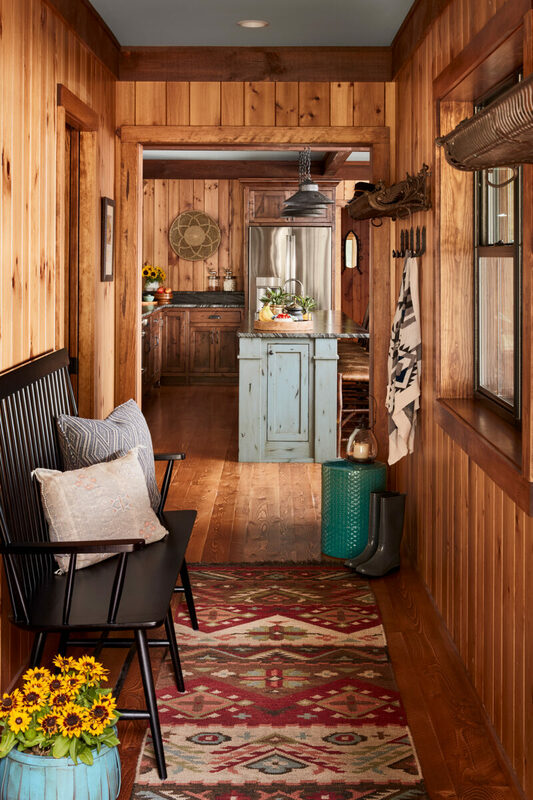 Navajo-style weavings, antique rugs and cozy quilts make this cabin feel like a haven. State-of-the-art amenities deliver modern convenience. Original boxcar luggage racks and railroad-tie hooks pay homage to the lodge’s unique beginnings. Spaces are arranged for large gatherings as well as quiet relaxed enjoyment of Wisconsin’s North Woods’ rustic refinement.